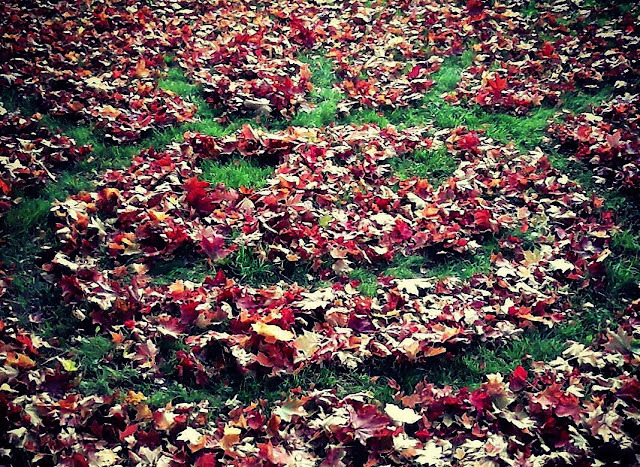 Can anyone else really feel Winter creeping in? I'm not some kind of softball, I haven't turned my heating on yet or anything, but there is definitely a chill in the air. Every year around this time I get a touch of the blues. I realise I'm lucky not to get a full blown seasonal depression episode the majority of the time, although some years are worse than others. 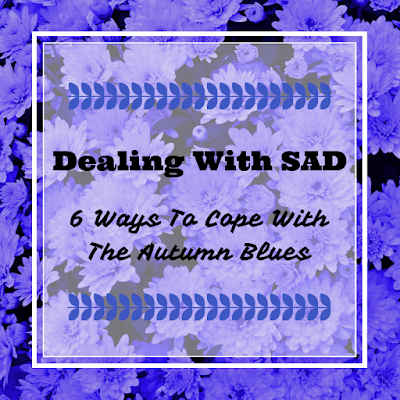 It's something I've learnt to recognise and put my own strategies into place to counteract the feelings of sadness, anxiety and exhaustion. 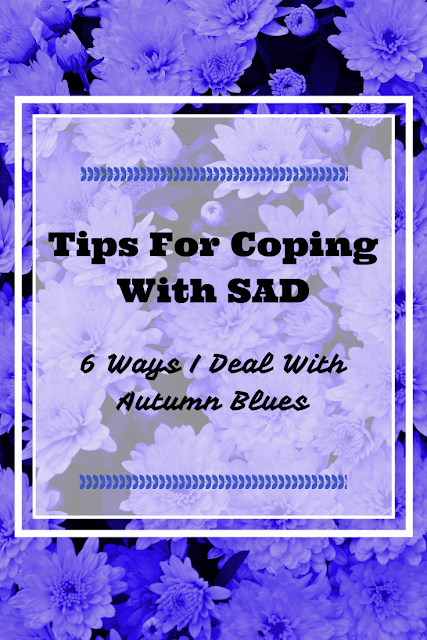 I've shared some on this in previous years, one of my favourite posts is here and has several ideas for dealing with SAD. This year, I thought I would recover those ideas and add a few more. I hope this might be of help to anyone who has a similar outlook when October hits, but obviously, I'm not a mental health professional and if you find that you feel so low you aren't functioning properly, it's probably worth a visit to the doctor who can recommend various interventions. One of the things I've noticed in my thirties is that people are much more willing to discuss depression and feeling low. I have quite a few friends who I have in-depth conversations about the feelings that can happen upon me during this time and I am confident in saying it's almost certainly the thing that has helped me the most when it comes to pulling my socks up and getting on with things. It really helps to know that other people, not just random Internet people but my actual friends, are going through similar stuff. There can be a feeling of isolation that comes with anxiety and depression disorders and quite often realising that other people are feeling the same way can put a mind at ease. I'm not alone, these feelings are normal and almost everyone has them to some degree, some of the time. If you struggle to connect with people in this way, I've noticed something that might help. Sometimes, people don't WANT to just sit down of an evening and start talking about their depression, why would they? There's still a stigma around mental health. But you can listen for clues and be the first to state that you feel something too and this can open doors to conversations that have a real benefit in dealing with SAD. I spoke in my post last year about some of the things that I do to overcome the blues. 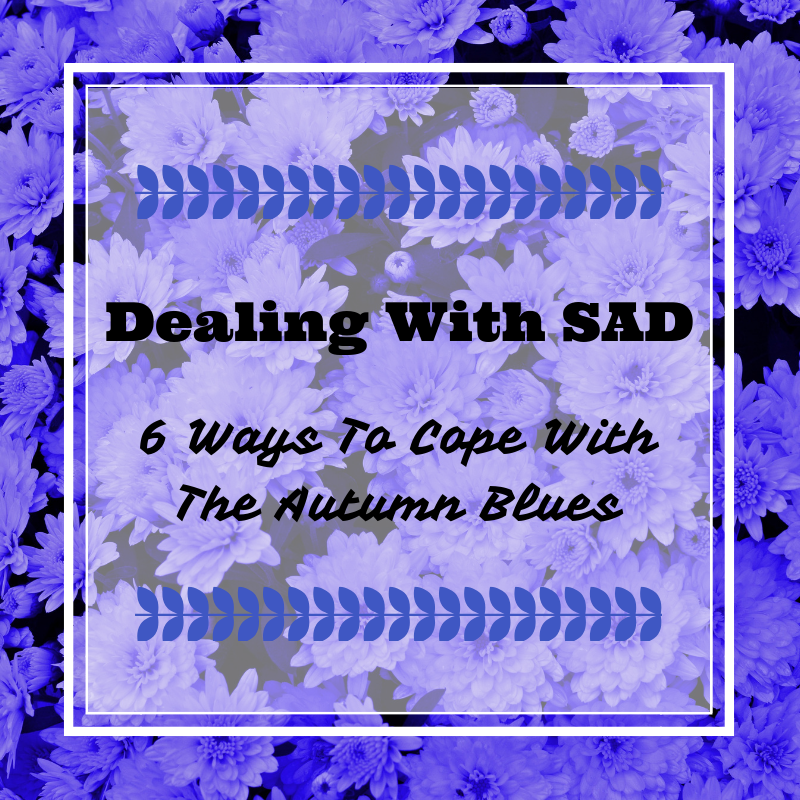 Seasonal depression in the most part is encouraged by a lack of Serotonin. Not getting that Vit D hit from the sunshine can really affect your minds chemical balance but there are small things you can do to boost your bodies production of the hormones needed to counteract depression. Eating dark chocolate, hugging, watching baby animals, exercise and creating self-care rituals all have an impact on how much Serotonin your body produces and at the very least, giving yourself a positive task to complete that you know has the capacity to make you feel better can have a great result. Don't sniff at doing tiny things for yourself - a face mask, a bar of chocolate and a favourite film, or spending time with people whose company you enjoy can prevent you from dwelling on the negatives. Autumn is a great time to cosy up with a book, in my mind - I don't get a huge amount of reading done during the hustle and bustle of the summer so I tend to save a reading list that I want to work through when Autumn hits. One of the books that has helped me most in overcoming my negative thinking patterns is Heart Of The Revolution by Noah Levine. It's a book on Buddhism for beginners and it covers a lot about letting go of guilt and focusing on positive experiences without clinging to them and being sad when they are over - this really resonates with me during times when I I feel down and it's a book that I go back to over and over. If Buddhism isn't for you, it's a great time to read a book that benefits you in another way. I'm just starting The Multi-Hyphen Method by Emma Gannon. It's a book for people who want to develop various streams of income from their skills and aren't necessarily defining their success in terms of working a 9-5 job day in day out. Reading books like this inspires me to work harder at making my dreams a reality and it also takes my mind off my mild depression because I'm focusing on the future. Other books that have helped me through the winter months are The Happiness Project by Gretchen Rubin, Eat Prey Love (the book is infinitely better than the film!) and various books on mindfulness and motivation that I'll share in a future post. I'd love to hear your suggestions in the comments for books that have helped you through dark times. Next up for me is The Kindness Method - about treating yourself kindly for a more positive life. Probably the most over-egged bit of advice ever, I'm pretty sure there are few ailments that exist that at some point the patient hasn't been told that getting some fresh air might help. At school, Matron would suggest I sat by an open window for pretty much any injury - broken your leg have you Katy? Some fresh air will surely mend those bones! Now, if I see sunshine, I make a point of getting out in it. Vitamin D is absorbed through skin, so roll up your sleeves and trousers and get outside to take in some of that wonder vitamin - it's one of those irritating things that won't make an immediate impact, but increasing your sun exposure during September and October is proven to have an impact on the severity of your Serotonin deficit over the winter. People will often refer to Anxiety as one illness, one mental health issue. "I have Anxiety" people will say. "I feel Anxious". Actually anxiety is a catch-all term for a number of disorders. Finding out which sort of anxiety you have and what triggers it can be a lifelong process. I've noticed that few people talk about the specific form that their anxiety takes. Is it too personal to discuss? Are people worried that others will view them as crazy? Do people use the term 'anxiety' because it's easier than explaining that they are terrified by social situations, health issues, accidents, crowds, heights etc. If you are able to define to yourself what makes you anxious, this can help you to avoid triggers. One of the forms that my own personal anxiety takes is health worries. During low days, I can spend several hours googling non-specific symptoms and diagnosing myself with every type of illness I find. On really bad days, my brain will start practising how I will tell my friends and family that I'm dying. It's stupid and it's a waste of time, but I since I started to pick up more on what triggers me to have worse moments I am able to try and avoid situations were those triggers might appear. I don't watch hospital based reality shows anymore and I've deleted myself from several health forums. 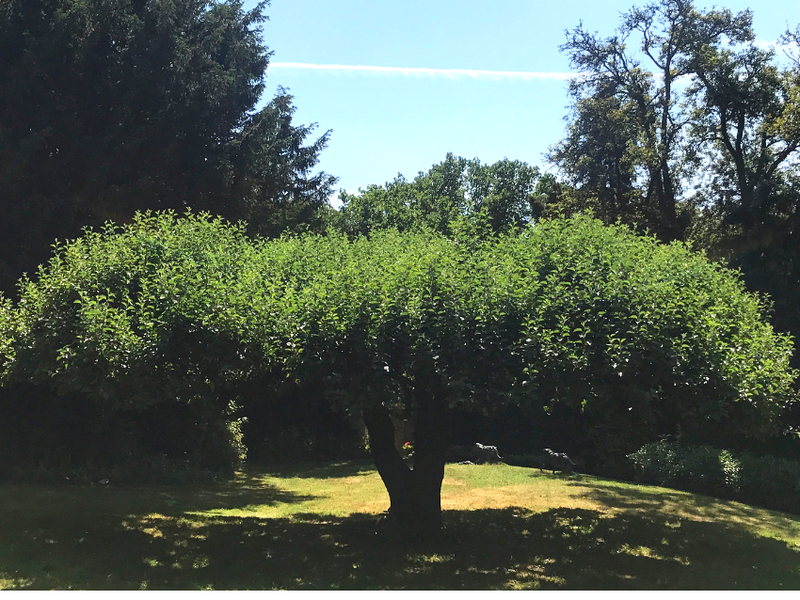 I've unfollowed individuals who blog about long-term illness because their updates can start me off on a worry spiral again - when I am going through a low time, it helps to avoid things that make me feel lower. I mentioned this alarm clock in my previous post but it's so good I'm going to mention it again. It's about £60 on Amazon and at John Lewis and it wakes you up slowly with warm light that projects on the nearest wall in a sun ray pattern. Waking up feeling like I actually want to get out of bed is a complete change to normal because usually, as soon as the mornings get misty I want to huddle up in a ball at the bottom of my duvet and not speak to anyone for a month! This isn't one of those vitamin D giving lights, it's just a more natural and refreshing way to start the day! I hope some of these might have helped someone, somewhere. Please do comment your own coping mechanisms below, I'm always on the lookout for ways to boost positivity going into Winter. I'm really excited to start sharing posts about my recent journey into crowdfunding. As you may already know, I've been running a Kickstarter project in addition to working on my website, it's currently 21% funded with 19 days to go - not terrible, but not awesome either and I've hit a MAJOR plateau with no bids for several days. I'm hoping to be completely honest in the upcoming posts around crowdfunding and I want to start off that way too. I'm not an expert on crowdfunding, or Kickstarter, or anything to do with launching a business this way! I was recently approached by a group looking for help to marketing their upcoming crowdfunding campaign through my marketing business. I really wanted to take on the project and I knew I had the marketing knowledge, but everything I knew about crowdfunding was based around one platform, and a few heady days of pledging money towards ridiculous projects like building a Death Star. Yeah, I invested in that. I spent a few days looking into crowdfunding. I spent time on Kickstarters Campus forum and joined several Facebook groups. I watched a great Facebook Live featuring Leona from The Indie Rollercoaster which gave me a lot of info in a very short space of time! And then I launched. If you care to check out my campaign, you can below. I'm going to share the first 5 things I realised after I launched - that I really wish I had known first! 1. It's all in the pre-launch email list. I didn't do this and I wish I had, I'll definitely do something in this vein if I relaunch or do another campaign. It's the advice that I have read the most regularly over the course of my research, - having a list of email addresses that belong to people with a potential interest in your product, or your campaign in general is an essential. The most common way of collecting email addresses seems to be through a landing page. A landing page is a simple website, featuring a brief description of what you are are hoping to achieve and an email input. Some of the ones I have seen that relate to crowdfunding have a 'Countdown to Launch' feature, which has the potential to build a sense of momentum when your audience initially visit the page. I should have got this landing page up and started directing people to it through social. Forming a community should play an key role in any crowdfunding marketing strategy and the email list is the start of this. It can also be used later on to target potential backers with updates about your project, which could lead to last minute pledges. 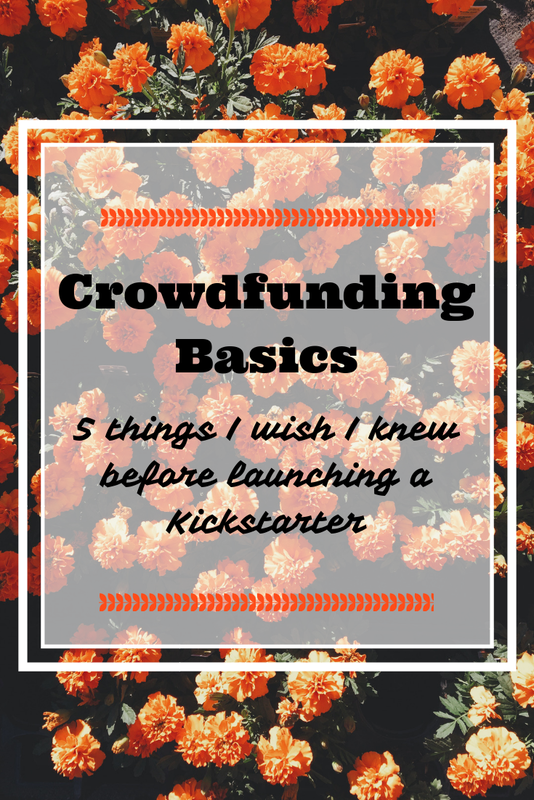 When I first started reading about crowdfunding I saw a lot of advice replicated across the board. I pushed a lot of these to the back of my mind thinking they probably weren't relevant for my project. Spoiler: They were. You need to create a video because it shows who you are to potential investors, right there in your campaign link. You also need it because all the other campaigns have it and if you don't, it looks like you aren't taking it seriously. Who wants to invest money in someone who isn't taking it seriously? This was probably one of my major mistakes. 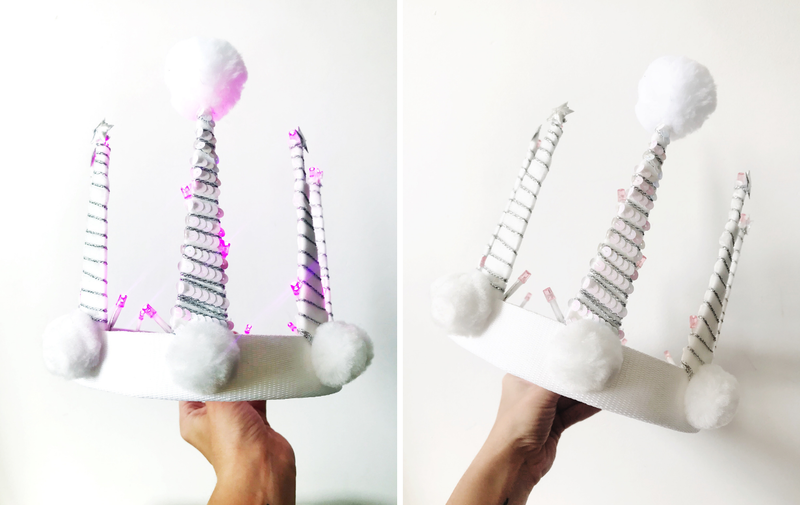 I'm still considering adding a video to my project, just something simple explaining who I am, why I like making crowns and what plans I have for launching an Etsy shop next year. There are several other elements to the standard format, including setting 'stretch goals' - these are goals past your original amount. Often, if the project reaches the 'stretch goal' there will be an additional reward released. 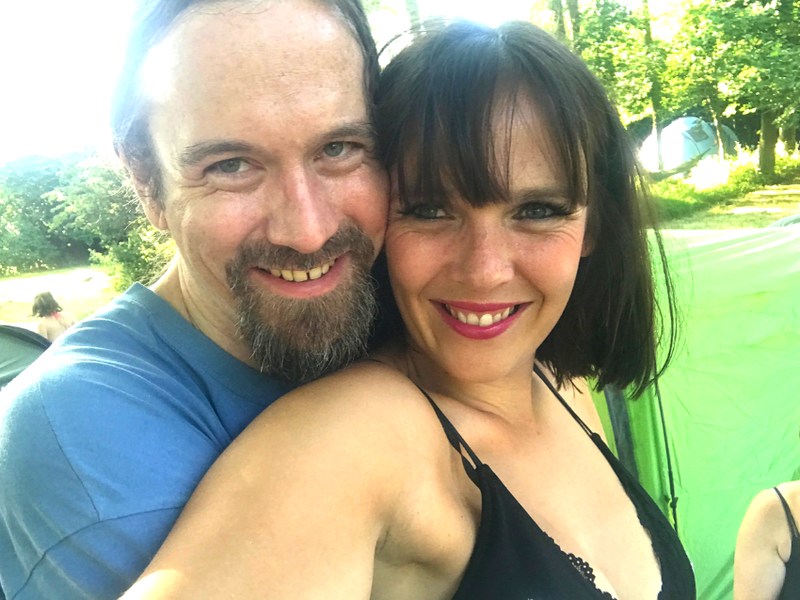 Pinterest was a great resource for me when it came to putting my campaign together - I've got an awesome Crowdfunding board here if you are interested. I didn't include this when I launched, but looking at successful campaigns afterwards I saw there was often a lot of detail about where the money would go. It's vital to remember that Kickstarter take 5% of your final total, IndieGoGo take 4% if you reach your goal and 9% if you don't. Paypal will usually have a charge of 3-5% too. Budget for at least 10% in fees to be sure. A pie chart looks cute and will make your funds allocation clear. Set a small margin for error too and don't forget to include packaging. I made a huge mistake in not working all of this out before to launched so be a boss and work out your costs! I kind of assumed there would be an inbuilt way of reaching Kickstarter lovers with my project, but there really isn't, not in the same way there are forums on Etsy anyway. Kickstarter Campus is a section of the website to which you can submit a questions and anyone can answer, but I answered a question last week and it got approved yesterday. Frustratingly slow. Actually having a look now, despite it being a pretty basic question, I haven't had any replies. 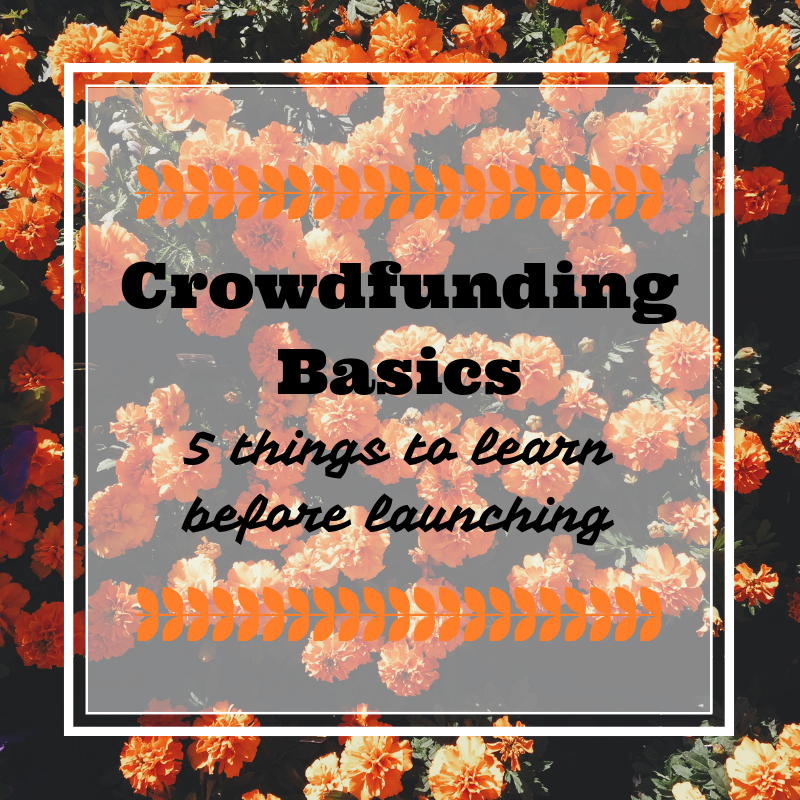 So, you are definitely going to need to reach out a lot further if you want to promote your project to people who already have a basic idea of what crowdfunding is. I ended up using Facebook Ads to target people who liked music festivals and also knew about Kickstarter, but I will talk about that in a different post along with the results from my paid Facebook Ad campaigns. Facebook groups I joined, which I'll share in a later post also, seemed very inactive and spammy. There is a reasonably helpful subreddit which you can share your link on, but unless it's a tabletop game or some sort of fiddly gadget it's not the best place to promote either. More to come on this subject in the future, but I wish I'd looked much deeper into this before launching. 5. Rewards that are handmade, custom items are the hardest to fulfil. I hope that these has inspired you to research certain elements of launching a crowdfunding campaign and creating a marketing strategy for crowdfunding projects. There is so much to learn! Please give me a follow on your RSS reader or on Instagram @katyclouds if you want to follow my Kickstarter project more closely. I'll be sharing a lot more about what I have learnt over the next few weeks. 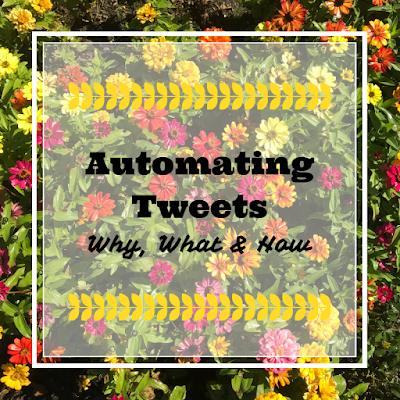 Scheduling Tweets - How, Why and Where? 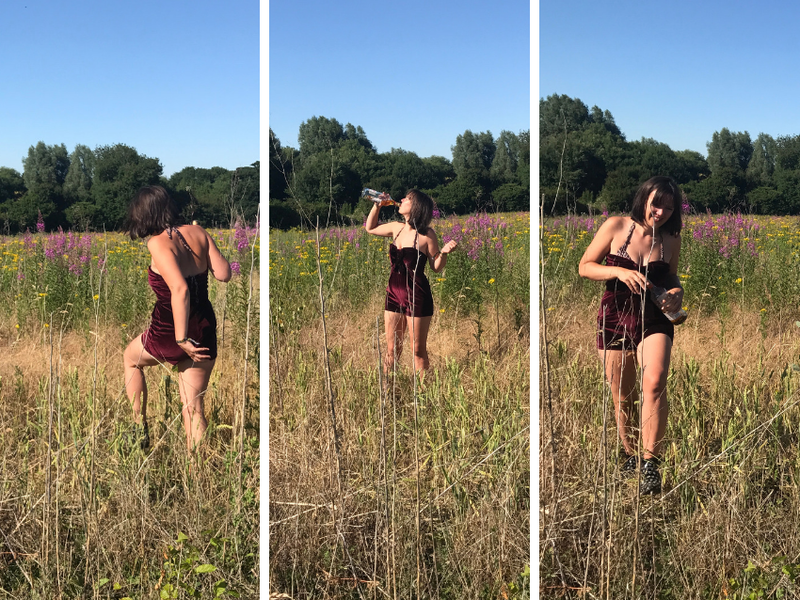 I'm now juggling three Instagram accounts, two Twitters and two Pinterests and that's before I take on any clients through Strange Marketing. I'm working hard to become more organised, trying to make sure that some content goes out on each platform, each and every day - no easy task! Although I've written before about automation and why I think it's killing Instagram (click here for that cheerful piece!) there are certain situations where using an automated posting platform is beneficial and can keep your content flowing smoothly allowing you to focus on other things. It's well documented that one of the curses of the modern world is the amount of time we spend bent looking at our phones. Obviously, many of us have chosen to work in the digital space and with that comes a requirement to be connected the majority of the time. However, I can't be alone in facing that awkward 'you spend more time on your phone than anything else' conversation with relatives or friends. It sounds pretty frivolous to explain that if you aren't there, posting content at certain times you won't gain the traction that you need to launch a project, or grow as an influencer. Automation means you gain a tiny bit of your life back, bundling the time spent tweeting into one handy segment - I do it on a Monday morning. That's not to say that as a small business or Influencer you won't need to pop on and check reactions and reply to engagements - but it does mean that when you want to focus on your real life, your social channels are ticking along nicely, looking active and gaining interest. 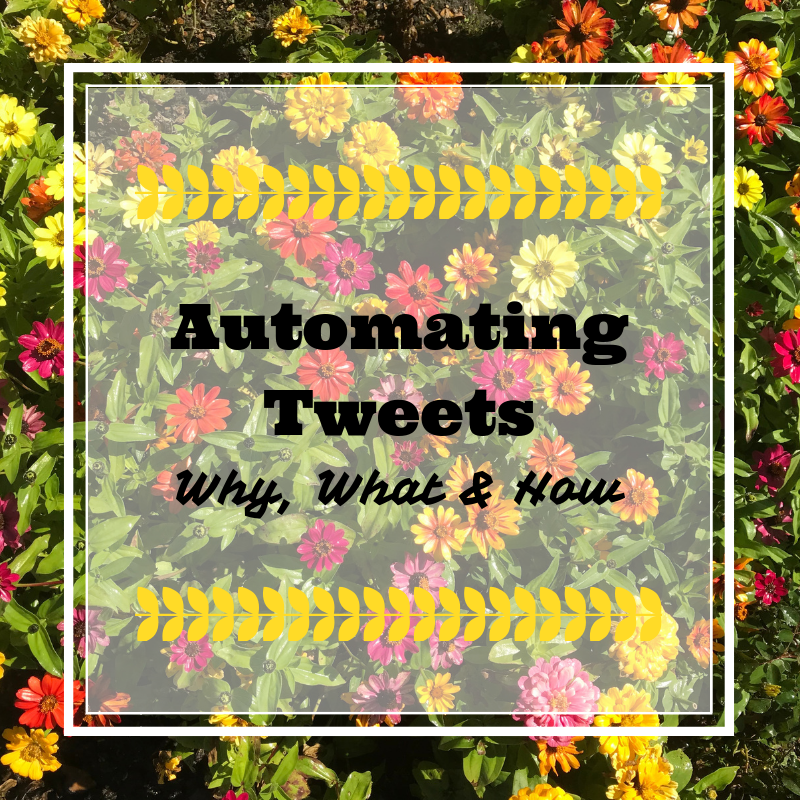 In addition, automating your tweets means you aren't creating it on the fly. You aren't trying to type it out on your phone scrunched into a wet bus seat where you might not have access to all your file directories (please tell me I'm not the only ones whose iCloud hasn't updated in 134 days?) this ultimately means you have more control, as you'll have everything to hand when you create your posting schedule. The type of content that works best is direct links to your blog or other promotional tweets, general questions to the twitter community or cross-platform promotion of your other social profiles. Here is an example of one of my recent tweets that I created through Buffer and posted out automatically to my profile at an optimum time. 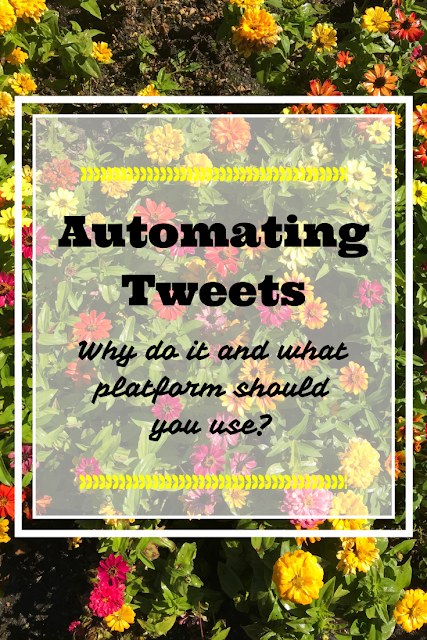 By using automation in this way, I'm making sure that my blog is being promoted throughout the week. I'll add to this with tweets of my own ad hoc, but knowing that my profile is looking active, sharing my blog links and generating engagement without me having to spend the time hooked up to my mobile. 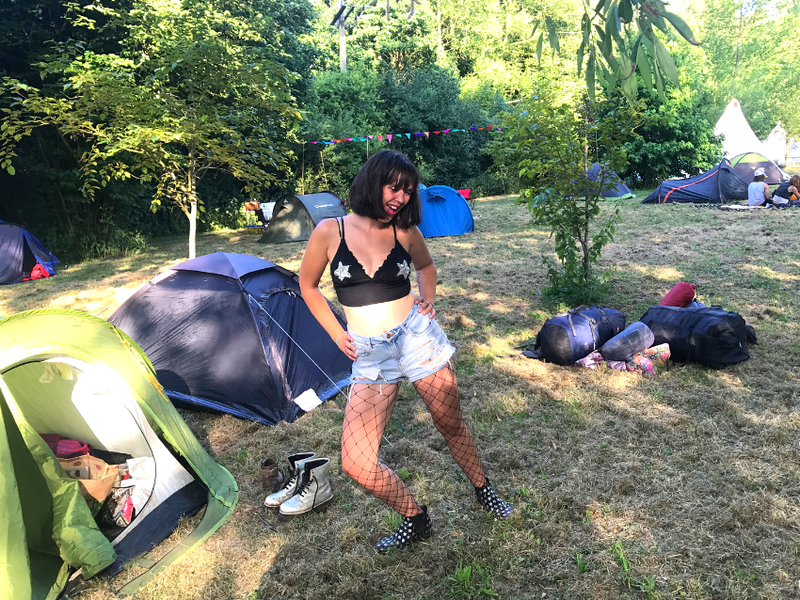 Over the week, I'll mix things up, sharing blog posts from my back catalogue that haven't got a lot of love recently as well as questions that I hope will get engagement - when I was blogging festivals during the summer, for example, I threw a few questions about favourite gigs and live music events into the schedule. In order to answer this question, I tried out three platforms. I'll include some thoughts on each below but I think it's pretty clear which one I would recommend! Hootsuite - I've got a premium Hootsuite account because I plan to use it when managing my clients social media. It's a market-standard platform with a lot of useful features and the ability to review and engage with multiple social platforms through it's interface. You can schedule tweets quite simply, just type what you want to say into a box, add a link or image and then select a time that you want it to go out - their Autoschedule features will post the content at a peak time for you. You can have 30 scheduled posts per month if you are a free user. One of the great benefits if you are using Hootsuite for business is bulk uploading, you type all your updates into a spreadsheet and mass upload them to be posted at optimum times! Recurpost - Oh Recurpost, I had such high hopes for you! Recurpost is a scheduler that works in a different way, you create Libraries around a certain theme (so, blog posts, jokes, memes, whatever you want to share) and then for each Library you create tweets. For each tweet, you then create several variations. You add the Library into a schedule which is optimised for your timezone and Recurpost will post out your tweets and variations until your library is empty and you need to start again. Main issues for me were that it didn't post images as part of the variations, just links, and when the Libraries were empty it was a real faff taking everything off the schedule and starting again! I can see this being really useful if you want certain content going out on certain days but for me there was a lot of unnessecary messing around. Buffer - The dream. Super easy to work, free users can add up to ten updates to their queue at a time, you can select what times they go out or Buffer will optimise it for you. 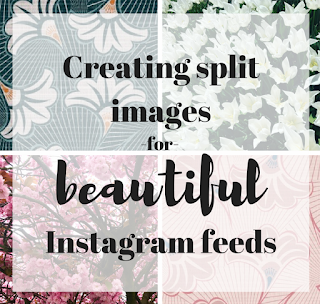 It's really easy to add images to each update and to make it even easier, if you include a link, Buffer will pull images from the site for you to select which for many of us Pinterest-optimised bloggers means not sitting around waiting for images to upload, just type in the text, copy the link, chose the image and it's a go. I wish I'd known about Buffer before paying for a premium Hootsuite membership because it's so much simpler, the interface is nice and it works like a charm. I hope this has helped! I would love to here your reviews of platforms that perform a similiar task - I'm always looking for ways to streamline managing several social accounts and still growing on all of them. This year I'm going to give Blogtober a try - a post day for the whole of October. I've been blogging for 15 years but I don't take it hugely seriously - I kind of want that to change especially as I'm launching two separate online ventures at the moment. The first is my digital marketing and Influencer biz - Strange Marketing. My Dad has helped me with the site and it's looking pretty awesome! Over the next few weeks I'll be adding a lot to the free content section which I hope will help anyone looking for guidance to setting up social media for their business. You can follow Strange Marketing on twitter here and on Instagram here. The website is here. I'm also launching my handmade crowns on Etsy this week - that's my main goal for the first week of October. So, if you have found this post from my Etsy profile, please do give me a follow on your RSS reader - I'm hoping to build a fun community of crown-loving guys and gals through my blog and my social platforms. Follow my crown-making ventures on Instagram here. 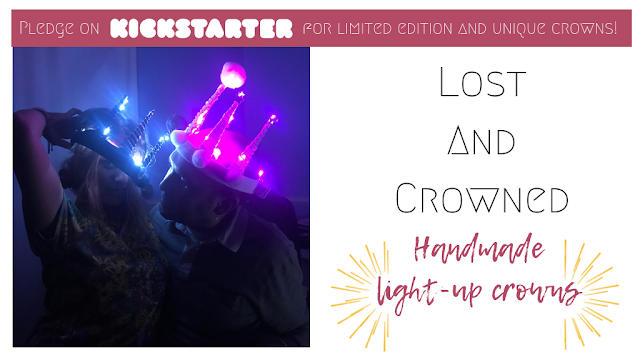 You can also get a custom crown through my Kickstarter project which is running until 22nd October - here is the link! So, please join me over October as I share lots of information about growing your social channels, crowdfunding and starting a new business - I'm really excited to see what can happen this month - What are your goals for October? Pop them in the comments! I'm kind of late sharing these photos and review of Curious Yellow this year - for a number of reasons. 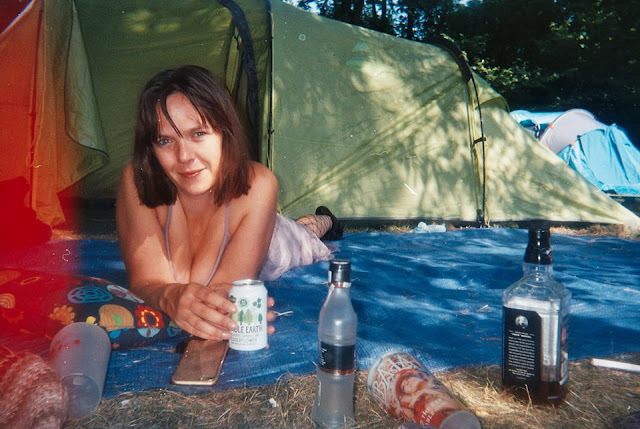 Firstly, I have been beavering away developing my own business! I'll share more over the next few months as I work to promote it and start taking on clients but you can check out the website and a lot of free info by clicking here and visiting Strange Marketing. But, anyway I am here to talk about Curious and the fun and weirdness that we had in the beautiful Gibberd Garden. 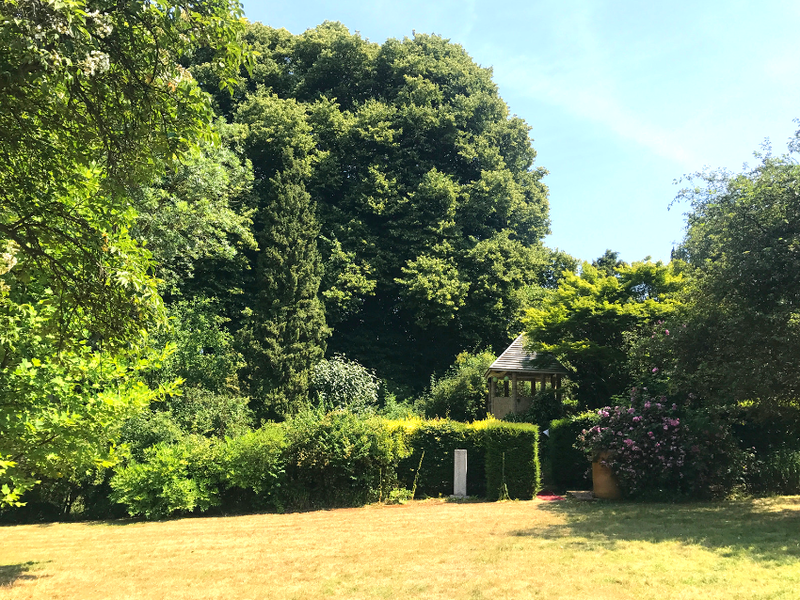 I've made a promise to myself that I'm not going to gush about the gardens this year, I'm pretty sure the majority of my blogs about this event are just me raving about the location so I'm going to try to avoid that as much today. Every year I go to Curious Yellow, it is life-changing in some way, redefining how I see myself or my relationships. This year was no different and everything changed for me in the few days that we spent hidden in gardens. The excitement in the lead up this year was SO REAL I almost couldn't stand it. I actually gave myself several anxiety attacks in the preparation because I couldn't believe it was finally here, after counting down for exactly 365 days. 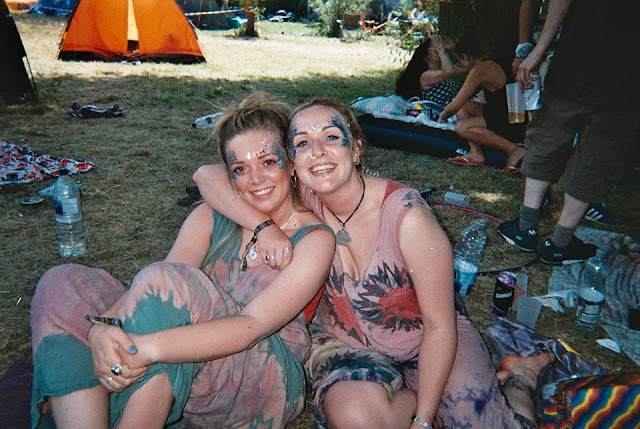 When we finally arrived, the spot our friends who got there first had picked was perfect, and this year we came down the lane instead of dragging our camping supplies through the gardens which meant we had no idea what installations, tents or stages were in the main arenas until we were fully settled. 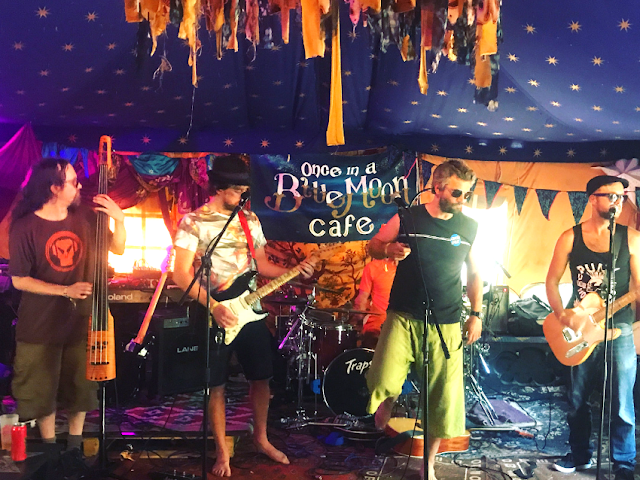 We heard some amazing music from Bare Jams and The Turner Brothers but my favourite set of all was Sweetcornbread in the Once In A Blue Moon cafe. Despite three days of pretty heavy drinking and misbehaviour (especially on the part of my bass-playing boyfriend below on the left) they absolutely smashed the fence out of their Sunday afternoon set and had the whole audience dancing to their fun music. It was about twenty thousand degrees in Once In A Blue Moon tent (check out this post for more about their beautiful festival set-up) so I didn't get too many good photo, which makes me sad because they looks so freaking awesome and I'm not even just saying that because I date one of them. In a weekend full of wonderfulness, there were a couple of other things that stood out that I really have to mention. The incredible LCD screens in the smaller dance arena were controlled by a fabulous device call the Naztek which anyone could stick their hands in to create crazy digital patterns surrounding the DJ booth. I absolutely LOVE things like this, being able to interact with the set-up is really fun and brings a whole new dimension to the dance arena, especially at a smaller festival where everyone gets to have a turn - check out a video by clicking here. I also had a great time at the little open mic event held by some people local to us here in Hemel. Set in the folly, a little stone tower that I've always felt was a bit under-used, a variety of performers got up to sing. There was good, amazing and one or two who perhaps could do with a tiny bit more practise but where nonetheless, awe-inspiring for getting up and braving the small but raucous crowd. My friend Rachael singing Ballroom Blitz and our friends Dave and Ian deserved their applause for sure! 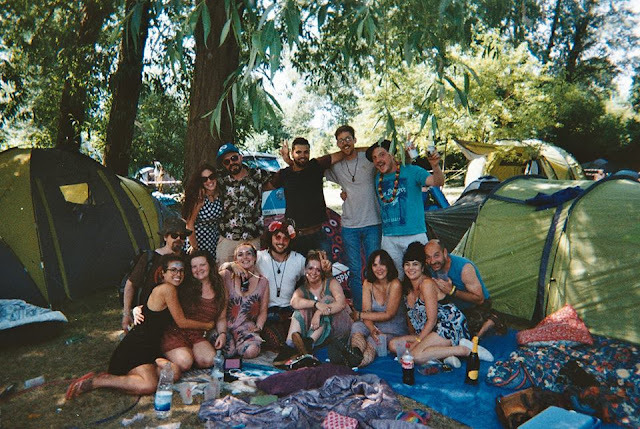 Song discovery of the weekend for me was this track by Asif Avidan which I heard covered in a pretty jaunty and joyful way by Bare Jams and then looked up afterwards and found the original for, it's a real corker, this guys voice is insane. 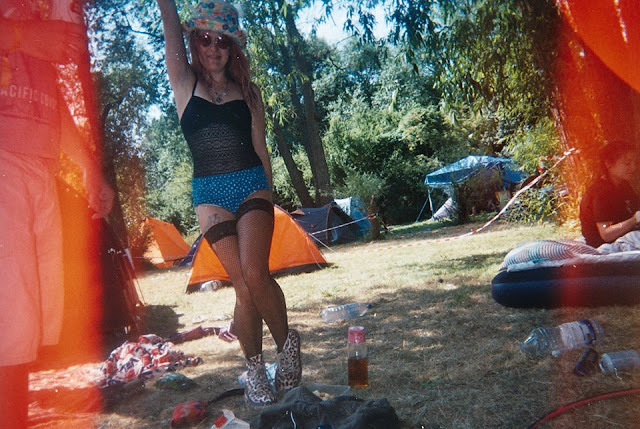 The rest of the weekend passed in a blur of whiskey, music and happiness, hiding in the undergrowth with some new found friends (thank you Grace and Georgia for concealing me when I needed some quiet time as well as the disposable camera photos!!) and wishing that time would pass as slowly as possible so we didn't have to go home! In comparison to other years I would say the set up was better, more professional, the stage looked great and so did the bars. There were none of last years issues with the generator and there was something going on all the time. 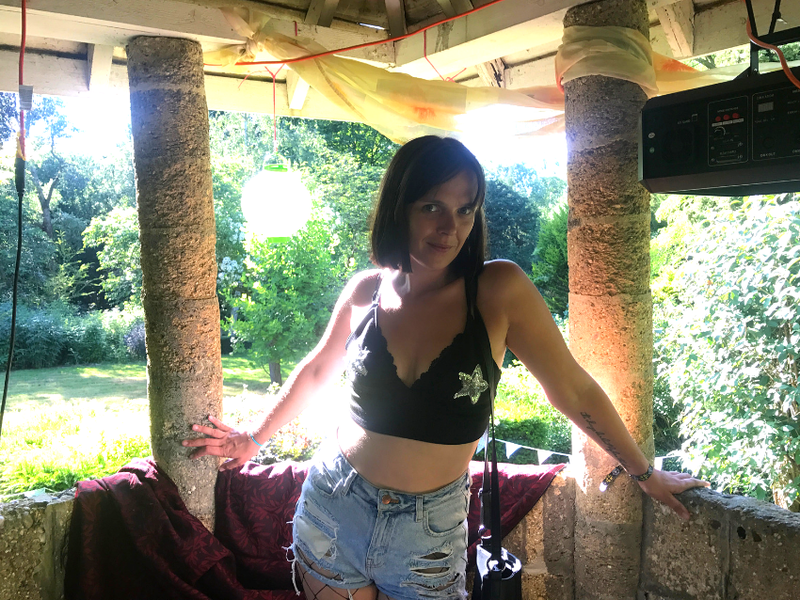 The main attraction for me is always getting to roam and explore the Gibberd Gardens on my own and with people new to the location and it didn't disappoint - if I ever have a reason to have a big outdoor party there isn't anywhere else I would consider, I really love this place so much. I look forward to next year, as usual, but I'm not able to share a ticket link currently. 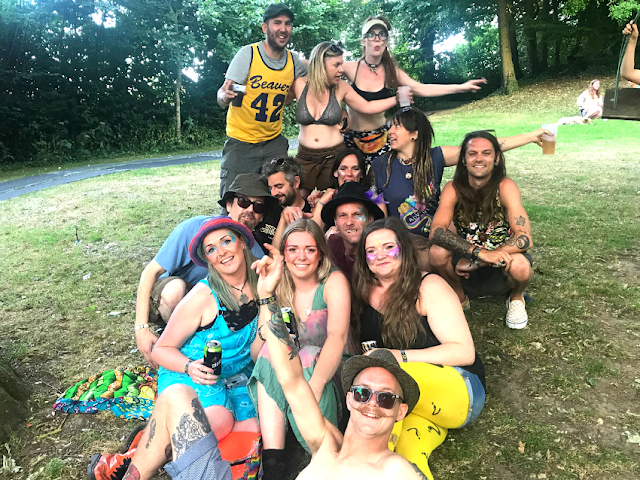 I know that there have been some issues with getting things booked for next years party and the team behind Curious are currently trying to raise funds to be able to continue putting on the event - here is a link to their Just Giving page. Now the summer has come to an end it feels like it's time to really buckle down and get some work done. In the words of Bret and Jermaine, it's officially Business Time. I'm working on launching my business, Strange Marketing (visit the site by clicking here!) and in doing so have been looking into which niches my expertise actually covers. One of the things I haven't seen a huge amount of people giving advice on is Instagram Stories and how to use them to promote your business and grow your brand so here I am today to give some of the knowledge that I gained as an agent to Instagram influencers in my previous job. 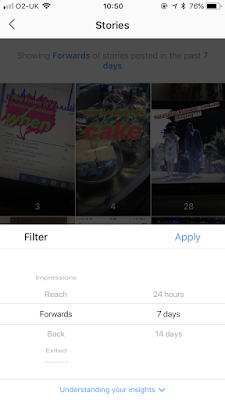 Instagram Stories is a feature of Instagram that allows you to create in-the-moment content that is visible to your audience for 24 hours. It's indicated by a purple and orange circle around your profile picture. When I look at followers or search for someone on Instagram, I like to see that circle around a profile picture as it shows that person is actively sharing new content, it's not a dead account or one that hasn't been updated for a while. This automatically makes them more attractive to follow. Influencers, that is, users with a following of more than 10,000, have access to a feature that means they can add a link to their Stories. By swiping upwards on the screen, the watcher will be taken straight to the link. This is a fab way to get people to look at a blog post or go straight to a retail page where they can make a purchase, which can be extremely beneficial when it comes to using affiliate links. 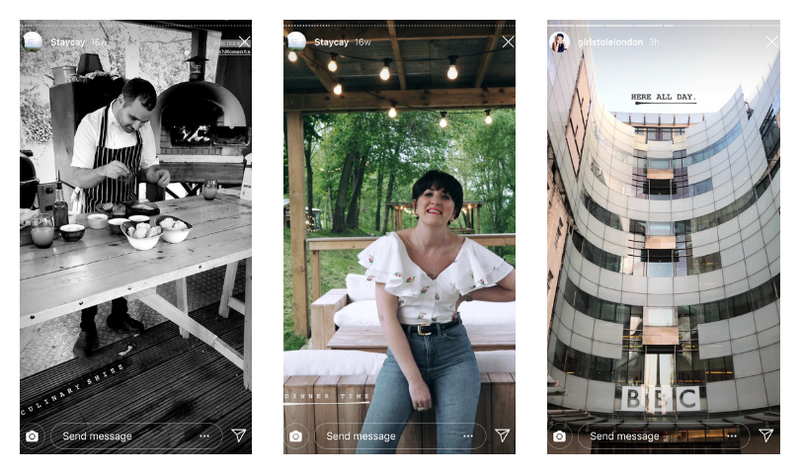 For the rest of us, who are growing their business and haven't hit that magic 10K mark, there are lots of ways you can use Instagram Stories to generate engagement, interest and purchasing action with a little clever thinking. So, let's get to the meat, How can you use Stories in the best way for your business? For any business, whether you design beautiful handmade goods or provide some sort of service (like my social media strategy services) it's important to build trust and be recognisable. The average internet user has an attention span of 8 seconds when it comes to content. If you can't get them in that time, they will swipe your Story away and be on to the next one. If everything you post looks different, random and unconnected, you aren't going to register in your audience's mind and they won't necessarily look out for your content. Stick to specific colours and fonts for your text. Chose something that goes with your brand, perhaps your logo colours. Don't forget you aren't limited to the little circles of colour, you can use the dropper to select any colour visible in the image and if you 'long press' on one of the circles you'll be offered the whole rainbow! Keep your text short and informative so that watchers can read it quick, even if they are shooting past your Stories. You can actually see stats about how many people clicked forwards, back or exited your Stories through your Insights. Frames can look good, although you would have to add them in another image editing program. I like to use A Design Kit (available for Android and IPhone) on my Stories to give them a fun look sometimes, but I have to admit I'm much more likely to just stick a GIF on there! If you are brave enough, use talking Stories. Talking directly to the camera isn't something everyone is comfortable with, but it definitely gives your audience a better idea of who you are and can help people feel that they 'know' you. I don't see anything wrong with whacking a filter on your face if you want to - using the same one with every talking Story is a another way of creating cohesive content. There are so many ridiculously beautiful Instagram feeds out there - I literally don't know how people have the time and inclination to only take photos that are pink and burgundy, but it's pretty common. 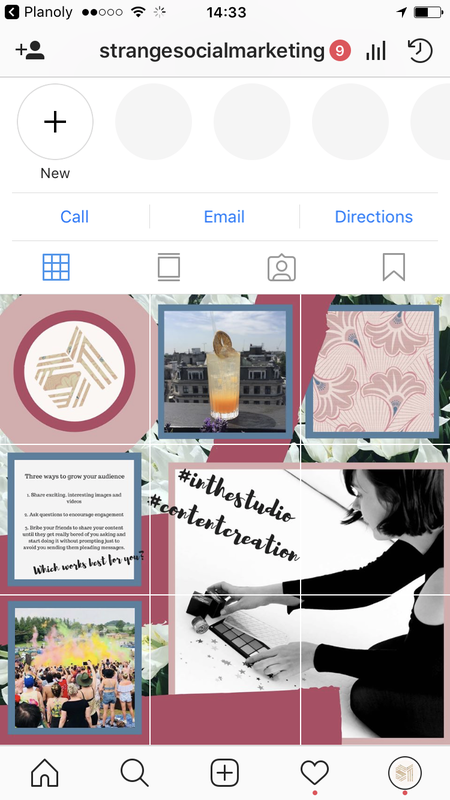 The Instagram feed for my business is kind of beautiful and I'm really proud of it, the images run into each other (I wrote an article on how I achieve this here) but it definitely means there isn't much room for sporadic content! Anything that isn't part of my carefully curated grid can go in Instagram Stories though, which leaves lots more room for sharing extra info and insights into the business and my day-to-day life. 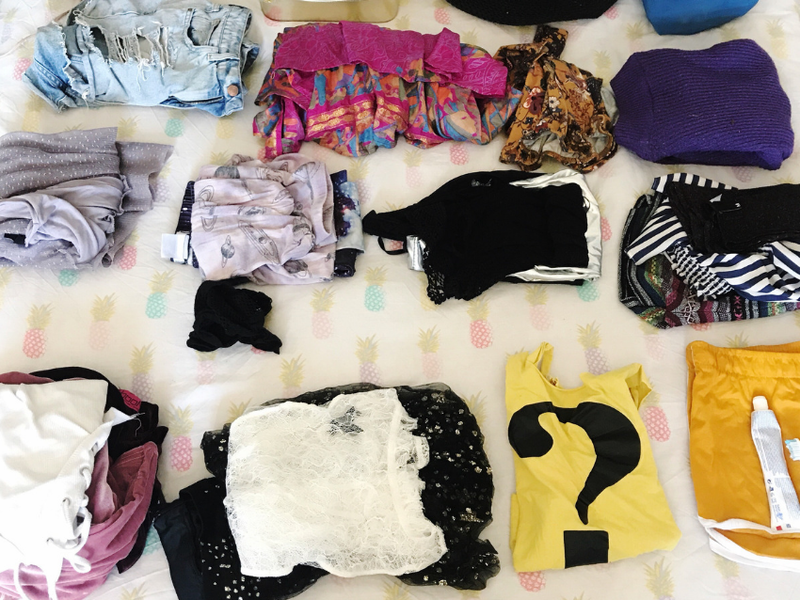 One of my favourite people for showing serious behind-the-scenes is Gummergal, an American blogger, her feed is what dreams are made of with a perfect house and baby and outfits, the lot. But her Stories are hilarious and often show the real house behind the blogger, mess everywhere, food covered baby. It really helps to build a bigger picture of her life and makes everything seem ultimately more real. 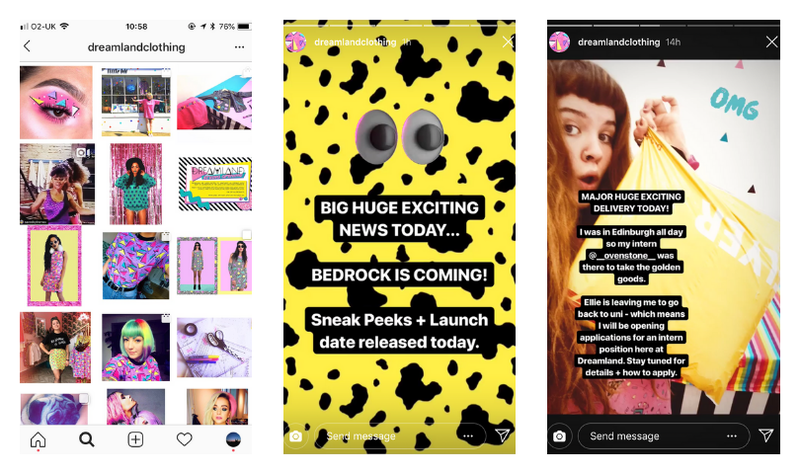 Another account I love for using their Stories to show sneaky peeks of behind the 'gram is dreamlandclothing. I LOVE their fun eighties prints and their grid is beautiful, all purples and pinks and eighties influences without being too rigid. They use Stories to share peeks of new collections as well as silly behind the scenes stuff that wouldn't fit on the grid. 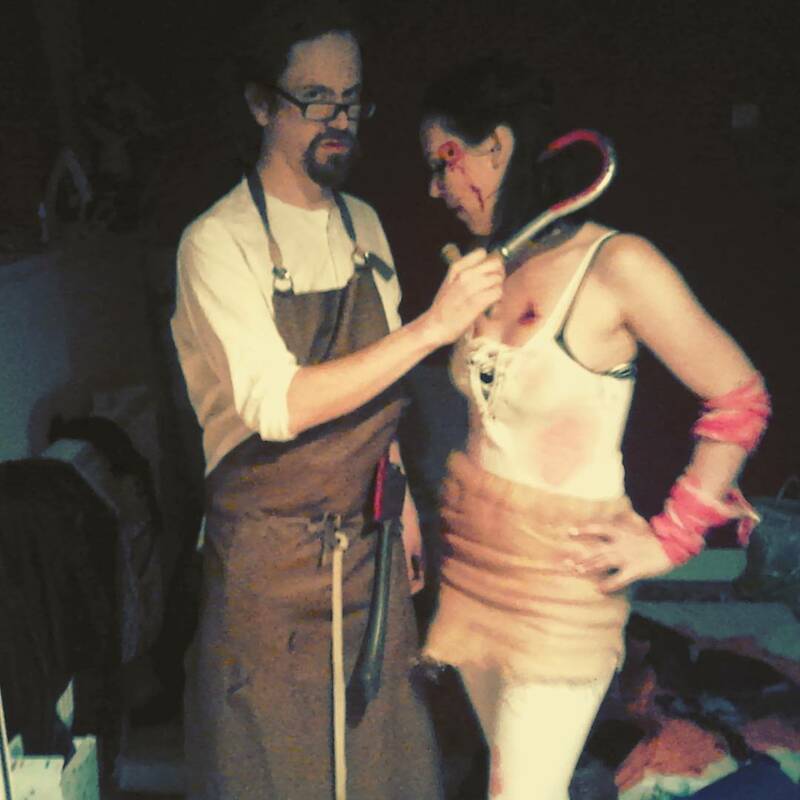 Share pictures of your work-in-progress. For handmade businesses, this can create some really fun engaging content for your fans and followers as well as show how much work, energy and effort goes into creating your product. Sneak peeks of upcoming content (a corner of a new piece of art, an off-cut of fabric) can build excitement for your upcoming product launches. Or, use GIFs to cover up elements of an image to create suspense - more about GIFs below. Create a video tour of your workspace, studio or office. People are always interested in this type of content and it adds to the picture that you are building of your business. You can use your voice or text to describe what you are showing. Don't forget you can film with your phone in the normal video setting then add to Stories afterwards, which means you can edit before sharing. 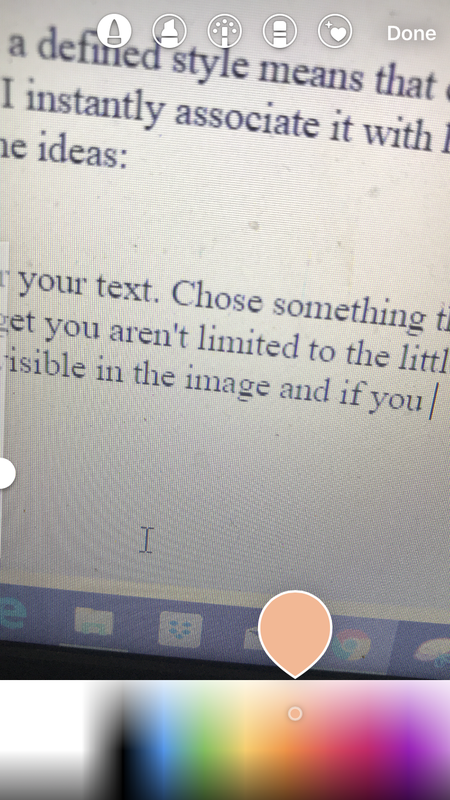 Most apps for editing include support for video content now too. My favourite is A Color Story, whose filters give my video a dreamy quality and it's free! Getting people to engage with you and your business is the whole point of using Instagram, or in fact, any social media. Whether that engagement is a like, a comment or a click through to your website, creating content that gets people to interact with it is everything. 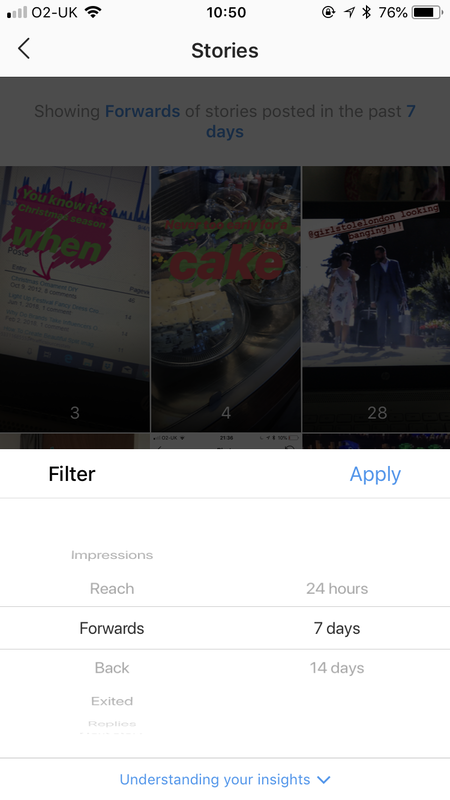 Instagram Stories gives you lots of ways to get people to engage with you. Use polls. 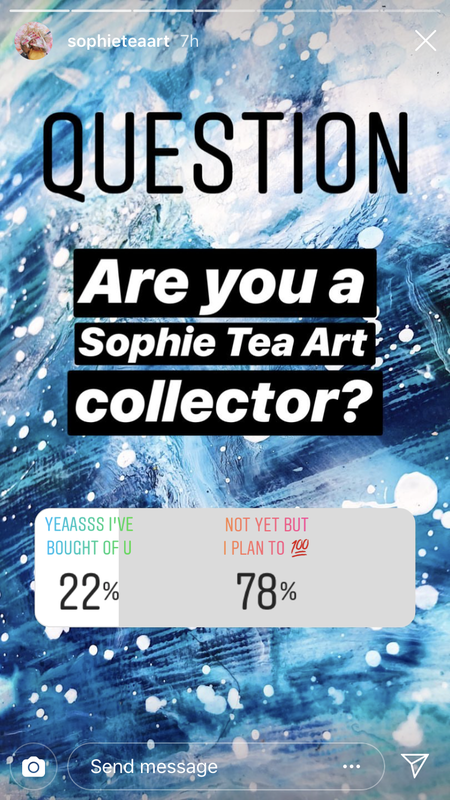 One of my favourite Instagrammers uses polls in the best way I have seen. Sophie Tea, an artist based in the UK who creates the most cosmic abstract paintings, uses polls regularly on her Stories to get her audience to engage, and both of the options she offers are positive. There's no room for negativity right? The majority of people want to answer polls and there's something almost automatic about reaching to tap the answer you most agree with, so this little psychological trick of offering only positive options does a lot to build positive brand awareness for Sophie. Ask people directly to message you. Every Instagram Story has the option to send the creator a message at the bottom. Remind your audience regularly that you are open to communication and you can also screenshot and share any lovely messages you receive, tagging the sender in. This has a significant impact on people getting in touch with you, as everyone wants shout-outs to build their own following. Questions! Instagram recently added an option to ask a question to your audience and many of the people I follow use it to do something like 'Ask me anything' - you get the option to share the responses as part of a Story which creates great interaction with your potential customers. So, once you have created some fab videos that kind of all look like they are coming from you and share with your audience stuff that you probably wouldn't on your regular feed, it's time to get a return on your investment. 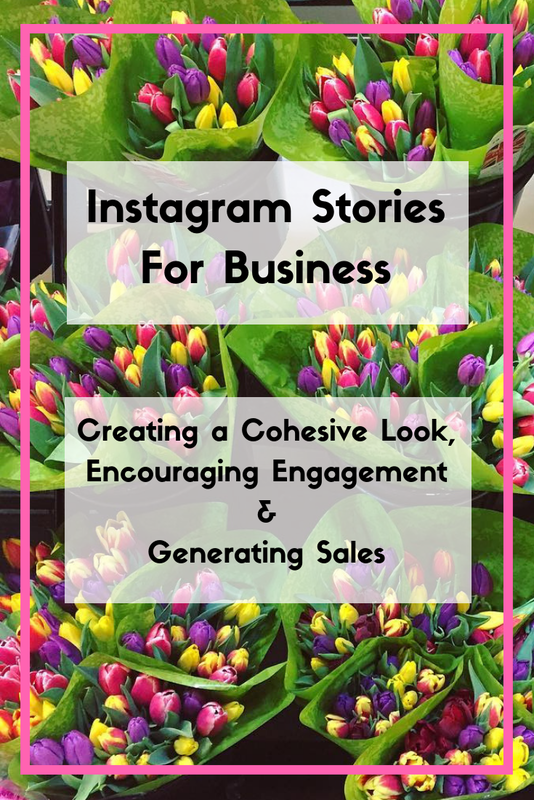 When I used to speak to clients about the benefits of using Instagram, I would explain the three things they had to gain; brand awareness, gaining followers and direct sales. It goes without saying that brand awareness + gaining followers = direct sales! Raising brand awareness is covered by all that stuff above. Creating a cohesive look and style for your stories, getting people to engage with you and sharing content that shows behind the scenes of your business - brand awareness level 100! Instagram Stories is primarily for your current audience as unless you are huge on Insta you are unlikely to show up on the Explore page. but there are ways to gain exposure to a new audience too. When I tag my stories with a location, even if it's just my local town, they get 100's more views and I tend to gain a few extra followers too. You need to add the location tag into each Story you do in a series - don't forget to add a slide that recommends people follow you for more great content! This works because people can follow locations. For more on following hashtags and locations, read my recent article here! Add at least one hashtag to every Story too. I recently found this great article on popular hashtags for independent businesses. Don't forget to use 'Link in bio' whenever you are talking about anything that your audience might want to buy - you need to make it as easy as possible to find your products. There are some really cute GIFS you can add to your Stories that say Link In Bio too - use them often! I love GIFS, my favourite ones are the drawings that look like they are coming out of something. With a little ingenuity it's possible to create a really fun and engaging Story out of something pretty mundane. Use your imagination when searching for GIFs and you'll find some really unique artwork, it's definitely worth a browse every so often to find more obscure, underused images. GIFs also have the benefit of adding something moving and eye-catching to an otherwise static image which might be enough to get a casual browser. 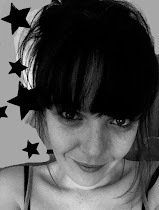 I've been spending quite a bit of time over the last few months setting up my own little freelance venture, Strange Marketing - check out my amazing website here! 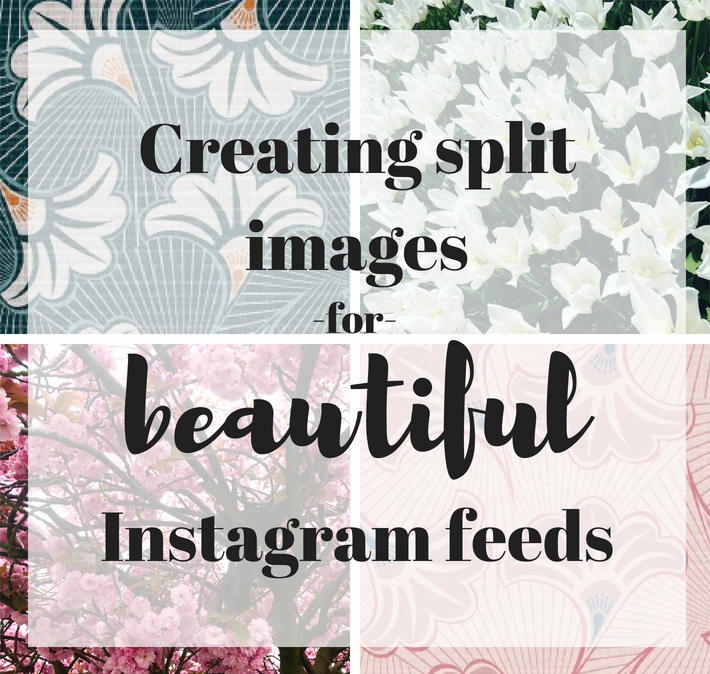 When it came to starting an Instagram account for the business, I wanted to do something I've never been able to achieve on my personal account, images that flow into each other. I first spotted this concept on Spectrum Cosmetics Instagram page. Whilst each of their individual images is a standalone picture, elements of the background serge into the next post. I think it looks great and one of the key things that stuck in my mind about it was that it's clear they have invested resources in developing their social presence - which makes sense for an incredibly success brand that's built it's entire customer base with Instagram. 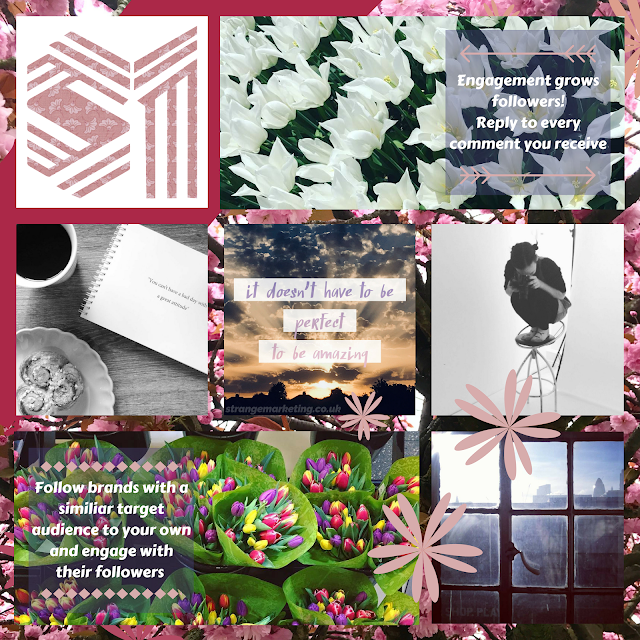 When it came to thinking about how I wanted Strange Marketing's Instagram to look, I knew I wanted there to be a 'bigger picture' but I wasn't sure how to go about doing it. I don't have Photoshop on my laptop and I also wanted to be able to create and post images while I was on the go. I tried a LOT of different apps to make this happen and below I've given you some info about each app - spoiler, only one app really did the job and it's one you have to pay for - but I did find a free and pretty simple way to do it also which I've detailed further down. I'm pretty pleased with how SM's Instagram page looks although I'm aware that my graphic design skills need improving on if I really want to make a splash, so any and all advice about composition and colours will be gratefully received. I'm excited to share more about starting Strange Marketing in the future! Once you have the larger image created you'll need to save it and download it in PNG form (so you don't lose any quality) If you want to use one the many image splitting apps available, you'll also need to export your collage to a mobile device, I use Dropbox for this and I also save every image including the main and split image onto my laptop. I tried a few apps but without a doubt, Planoly is the better option. Unfortunately, you can only upload 30 pictures to it per month in the free version, but I feel it's probably worth investing in the next level up for £7.99 which allows a lot more uploads as well as access to all their other features, including adding batches of pre-defined hashtags which can really save time when you are uploading 9 images at once! It also saves the images and the split versions for you, so when you are ready to post you can just open up the app and add the images directly into Instagram along with the hashtags and location information. It's a real time saver. I messed up the first month of my free trial by deleting images once I had uploaded them because I wanted to change something - this still ate into my 30 free uploads and meant I couldn't add another 9 images to the upload section. You can't save the split images to your phone in any easy way either. 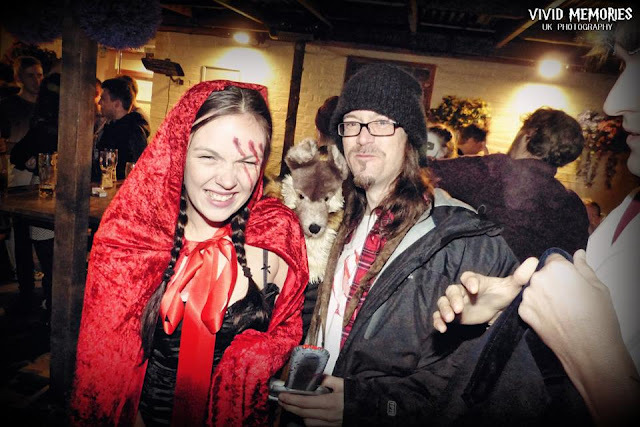 Giant Square - Easy to upload images to split but it adds it's own watermark which I definitely didn't want. I know this sounds a bit mean, because I do believe that apps should be able to earn money for future development etc, but for starting my business venture I needed something that wasn't going to affect the overall image. 9Cut - Worked well but there was some reduction of quality which I was trying to avoid. Grids - When I went into the app to remind myself of what it was I didn't like about it, it tricked me into signing up for a £4.49 weekly subscription! I seem to recall when I used it last week that the ads between every step were the main issue but I now seem to have a super version which works a lot better - at a ridiculous price! That's getting cancelled straight away. In the end, I found the best way to get what I wanted - all nine images in the same quality, with no watermarks, ready on my phone to upload to Instagram at any time. I used a site called Img Online an online tool which you can access by clicking here. The site creates 9 separate images which you can download individually. There are a few options to select from and you don't just have to do 9x9 grids. I chose the optimize for Instagram option despite not knowing exactly what this does! I then saved them to Dropbox on my laptop and was able to export from the Dropbox app on my phone straight into Instagram. I save my hashtags in a batch on the Notepad application and then just copy and paste them into my caption when I'm ready to post! I hope this has helped, whether you use an app or the online tool I would love to see your creations, tag me @katyclouds or my new business account, @strangesocialmarketing. I'm Katy...music-loving, coffee drinking, social media consulting, copywriting, proofreading, article contributing writer & blogger. If you would like to contact me about business opportunities, you can email me here, or add me on LinkedIn by clicking here.